Chen took the flower lay into his hands and said a small prayer, before hanging it on the rearview mirror and speeding through the green light. During the 14th century, Ayutthaya was the political, social and financial centre of the Siam Empire. Now an archaeological ground sight spanning through 289 acres, the complex features Khmer style temples to Ayutthayan style and stands as a testimony to the old ways before the Burmese invasions of the 18th Century. With a great deal to see and a lot of areas to cover between sights, going around the city is more a matter of time available than anything else. As a day trip from Bangkok, hiring a tuk-tuk or a taxi proved to be the best choice, as bikes, although inexpensive, require a great deal of stamina and heat resistance. As soon as we got out of the minivan from Bangkok, we boarded Chen's tuk-tuk and speeded through the broad boulevards of Ayutthaya to Wat Yai Chaimongkol. Climbing the steep stairs of the temple's central prang under Ayutthaya's relentless temperatures, made us take comfort in knowing that we had a private driver. From the six temples visited, most of them share the same architectural style and influences, in various stages of conversation. However, it's in the details that their uniqueness shines. The Buddha’s head inside a tree on the complex of Wat Mahathat attracts crowds like those of the Mona Lisa; Wat Racha Burana, with four Sri Lankan chedi, has the best-conserved prang (central spire) of the entire complex. Wat Phra Si Sanphet, with its tree stone chedi as a monument to the past, is the holiest of all and the one that suffered the most during the Burmese invasions. The reclining Buddha in front of the ruined Wat Lokkayasutharam is the centre point to witness daily life in Ayutthaya. Locals set up shops, selling flowers to worshipers, coconut water to thirsty visitors while their kids run around chasing sleepy dogs. Chai Watthanaram, our last stop, is constructed in the celebrated Khmer style. 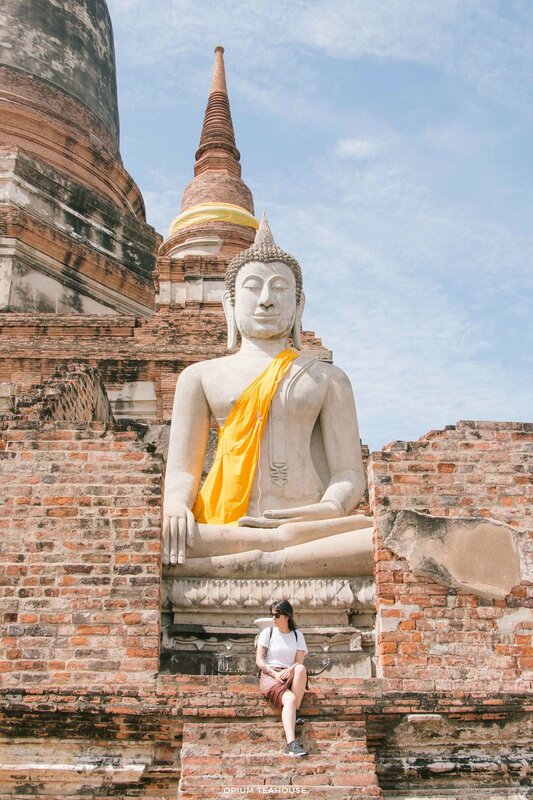 With a striking resemblance to the much more famous Angkor Wat, Chai Watthanaram is the temple featured in every poster, brochure or article concerning Ayutthaya. Easy to see why, when the sun starts to go down, the temple’s imposing silhouette rises about the levelled landscape against the orange sky. Taxi is the most convenient way to get to Ayutthaya, but the price will depend on where in Bangkok you are departing from and your bargain ability. Aim to get a price between 1000 - 1500 baht. Minivan/Bus from Mortchit Bus Station is the cheapest way (70 baht) and takes approximately one hour. However, getting to the station is not the easiest of journeys from central Bangkok as there are no MRT or Skytrain stations nearby. Reportedly it was possible to take a Minivan from the Victory Monument terminal. However, we were told otherwise and directed to Morchit from bus drivers there. It is also possible to get the train from Hualumpong Station with a journey time of two hours.